When you’re dealing with overwhelming debt, you need an Arlington bankruptcy attorney to guide you through the process of eliminating your debts and managing your expenses. You may be unsure of what steps to take next. Before making any decisions regarding your financial future, contact an experienced lawyer at Allmand Law today at (214) 884-4020. We service clients throughout the Mid Cities, including Irving and Grand Prairie. 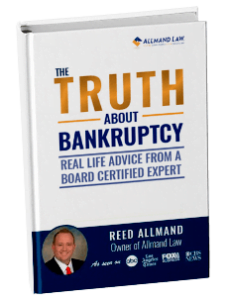 There are two primary types of personal bankruptcy – Chapter 7 and Chapter 13. Chapter 7 bankruptcy is often called “liquidation bankruptcy.” It allows you to eliminate your debts without paying them. Chapter 7 typically takes place quickly and allows you to get back to your life as soon as possible. However, your income must be low enough to qualify for Chapter 7. If you do not qualify under the means test, you may file Chapter 13, or “reorganization bankruptcy.” Chapter 13 allows you to reorganize debts into a payment plan that may last between three and five years. It often reduces interest rates and makes payments more manageable. An Arlington bankruptcy attorney can help you determine if Chapter 7 or Chapter 13 are right for you. Medical debts – Health care costs can be overwhelming. Although health insurance may cover some medical costs, you may still be left with significant debt after a medical emergency. Bankruptcy can eliminate your medical debts. Tax debts – Although many tax debts are non-dischargeable, bankruptcy may reduce some or allow you to pay them over time. Non-secured debts – If you have personal loans, payday loans, credit cards, and other non-secured debts, they may be dischargeable in a bankruptcy. Lawsuits – Creditors may have filed lawsuits against you. Many of those orders and garnishments are manageable through bankruptcy. An Arlington bankruptcy attorney can evaluate your debts and help you understand which are eligible for discharge through bankruptcy. We will compile a list of all of your debts and communicate with your creditors. Many people are afraid to lose their houses, cars, and other assets in bankruptcy. However, there are many exemptions that we can help you obtain in order to protect your assets. You may file Chapter 7 or Chapter 13 and retain your house, car, inheritance, and other assets. An Arlington bankruptcy lawyer will assess your situation individually and help you keep your property while eliminating your debts through bankruptcy. Even if you are in foreclosure or your car was repossessed, we can help. Foreclosure and repossession activities must be halted when you file for bankruptcy, so it’s important to start the process as quickly as possible. An Arlington bankruptcy attorney can quickly file the necessary paperwork to stop foreclosure and repossession. Allmand Law Firm has extensive experience with all aspects of debt management and bankruptcy. We will assess your situation and help you meet your financial goals. From filing bankruptcy documents with the court to communicating with your creditors, we can handle all of the legal aspects of your case. Contact us today to find out more about how to manage your debts. Our Arlington bankruptcy attorney will guide you through the legal issues with ease. Call Allmand Law Firm today at (214) 884-4020.